Rodgersias, in Germany also called „Schaublatt“ are impressive inhabitants of the shaded world. 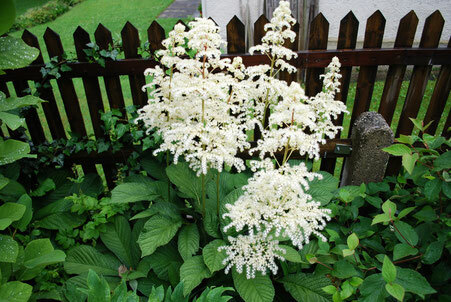 With their huge lobed leafes, resembling a buckeye leaf, and the many flowers in panicles they highlight a shaded bed. Most of the flowers are colored white or creamy white but there are also rose and even pink colored Hybrids availlable. It is noticable that also with the Rodgersias the leafes are highly attractive starting with sometimes striking coloration in spring when the leafes emerge and later with an impressive size. Besides some species meanwhile there are a few very interesting and beautyful Hybrids on the market as ideal companions to Hostas. 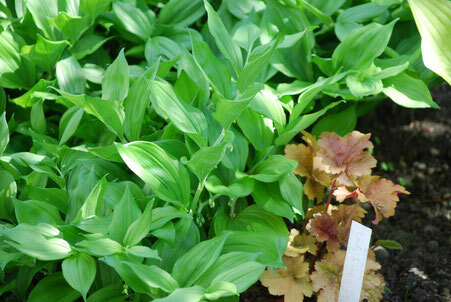 The Solomon‘s-seal (Polygonatum) is a very diverse genus. From a real dwarf reaching about 10 cm height to a climbing Polygonatum that grows up to 3 m tall there are nearly all sizes in between that. 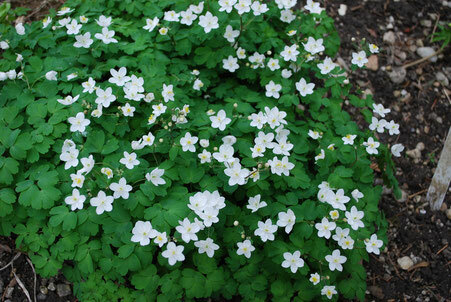 The flowers grow from the leaf axils and are mainly bellshaped in white, creamy white, green or rose colour variations. Polygonatums grow with rhizoms underground and many are quite vigorous some of them therefore qualifying as a groundcover. Because of the fact that most of them are woodlanders they love humusrich loose soil preferably not too dry. We are collecting interesting and rare woodland perennials, for example Isopyrum thalictroides (photo), Podophyllum, Arisaema, Smilacina, Epimedium and many more.We hope we can offer some of them in the future . Only a few are already availlable but not through our online shop yet. Some of these beauties need some more attention regarding soil, temperature and light, others are rather unchallenging and robust.